Are LibGuides Really Helping Students? I know many academic librarians are very attached to their LibGuides, understably so. LibGuides provide an easy-to-edit venue for academic librarians to share their subject expertise with students and other librarians. Do to their individualized nature and treatment of Guide Creators as “authors,” LibGuides are considered by some to equate published works in service to the profession. Certainly, the time it takes to create a well-designed and informative guide rivals the time it takes to craft a research article or similar scholarly project. Yet, the question has been asked, “Are LibGuides really helping students?” Many students seem to have no idea what LibGuides are or how to find them. In fact, I had never heard of LibGuides until starting the MLIS program at DU. Now that I know about them, I frequently use them when helping students answer questions in disciplines I’m not familiar with. Yet, in spite of efforts to publicize LibGuides to faculty and students, they don’t seem to be catching on. While the idea of sharing subject-specific resources is a great and timely one, I worry that we are too hung-up on the LibGuides platform. If we are trying to meet students at the point of need, working with instructors to embed resources in learning management systems like D2L or Blackboard seems the best way to reach busy students. Thoughts? Suggested articles in support of LibGuides for student learning? Formative assessment the way of the future for library instruction? For this academic year, we are looking for professors who would be interested in taking a look at our system, as well as possibly testing it out in their classrooms. We’re currently conducting quick, 20-minute online demonstrations for professors at DU to take a closer look at Top Hat. Our system allows instructors to receive live feedback from students during their lecture, as well as employ a wide range of question types including free response, numerical, and click on target, in addition to the more traditional multiple choice and true/false questions that clicker devices can handle. Also, it allows students to utilize the electronic devices they already own (e.g. laptops, iPads, iPods, smart-phones, and even traditional mobile phones) which means no hardware is necessary to purchase by either students or the university. Most importantly, our tool is as easy to use as PowerPoint and will coordinate smoothly with your lecture. This kind of system (and I’m sure there are other similar ones out there!) raises all kinds of possibilities for use with library instruction. For one, it could be much easier than clickers since students could use the computers in the instruction lab to respond to questions in real-time, with the results populating on the larger screen. Since the goal of formative assessment (as I understand it) is to be able to incorporate feedback immediately and adjust instruction to best fit the needs of the studentrs, wouldn’t it be great to know that, in fact, no one understood what you just said about using ILLiad? Or that this incredibly silent group of students already knows about Prospector and really wants to move on to something else? For gadget-loving students, the ability to use their own smartphones, tablets, or other devices could be a fun way to break up the class with an interactive element. Image by University of Central Arkansas, via Flickr Creative Commons license. The one potential hang-up I see is that libraries might need to figure out a different pricing model compared with other teaching departments on campus. In Top Hat’s case, they charge the student $20 per year to use this service (much cheaper than clickers) and the instructor has no fee–if this kind of service were used in libraries, would the library pay for the service? Or is the goal that this service would be adopted campus-wide so that students would already have accounts and be using this tool in their other classes? Intriguing, at any rate! Would be curious to know what experiences people have had using similar technologies at their institutions. After taking a fabulous creative writing class over the summer from Lighthouse Writer’s Workshop, I started paying attention to ways that libraries are helping support writers. Here are some of my favorites, from public and academic libraries. I-Street Press is part of Sacramento Public Libraries. 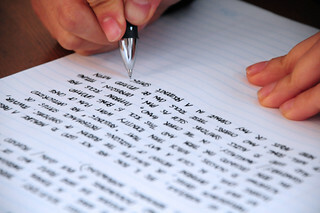 I-Street offers classes and equipment for those interested in boosting their writing skills. Class topics feature creative writing, editing, blogging, copyright, children’s book writing, writing cookbooks, and special classes for teens. The Press promotes self-publishing via an Espresso Book Machine. Three pricing tiers are offered so that authors have a variety of options. The most affordable, tier 1, charges a $25 set up fee, $10 per book, and a $0.02 per page fee. Thus if we assume roughly 150 pages for an average book, it costs about $38 for an author to have a print copy of her or his book! Books printed through the Espresso Book Machine are also added to the EspressNet catalog, and can be printed from any other Espresso Book Machine in the world. Currently, demand at I-Street seems to be far outreaching supply, but it can be hoped that in time I-Street will receive more funding to expand its innovative program. The Urban Libraries Council named the I-Street Press as one of their 2012 Top Innovators. Writing. Creative Commons Flickr photo by jjpacres. Douglas County Libraries are experimenting with new models to offer e-books to their patrons. Using their own Adobe Content Server, they are working directly with publishers to offer more than 8,000 titles. Right now, they are able to offer eContent from 12 publisher groups (including Gale Cengage). This is content that they have purchased and own—not just leased, as most other e-book models are currently designed. For the future, they have plans to open up their server to self-published authors. Authors will be able to give an e-copy of their work to Douglas County, who will host it on their Adobe Content Server, and make it available to patrons through their VuFind catalog, potentially including a link for patrons to buy the work, too. Local authors, in particular, could find new audiences for their writing in this way. If patrons are able to review and recommend e-books, authors could grow their following and generate profits from their creative work through this system! Read more about Douglas County’s e-book innovations in this Public Libraries Magazine article, “The E-book Experiment.” Interested organizations can replicate the Douglas County model through step by step instructions. Topeka-Shawnee Public Library started a community novel writing project! One new chapter was published each week, written by various authors in the area. The project has made it all the way to completion and a book signing was just held at the end of September. This is great publicity for the authors, as well as a fun way to motivate people in the community and keep them coming to the library website each week as new content is released. Check it out! I poked around looking for partnerships between academic libraries and writing centers. I’m curious to see which libraries are going beyond simply being located close to the writing center. There must be some innovative projects happening out there! I did find this project at the University of Chicago. Special Collections Librarian, David Pavelich, held special sessions for students in the MFA program that involved learning how to do research for historical fiction, exploring self-published works through the ages, and studying drafts, editorial changes, and different manuscript versions to better understand the creative process of well-known writers. Read the College & Research Libraries News article here. Do you know of other cool collaborations? Let’s hear about them! I went to Atlanta to see my family two weeks ago and while there I was able to visit the director of library services at DeVry Atlanta Metro, Tiia Kunnapas. I’d met Ms. Kunnapas while waiting for the airport shuttle at the end of this year’s American Library Association meeting. Ms. Kunnapas was kind enough to set up a tour for me of her own library at the DeVry campus at Decatur as well as a tour of the Robert W. Woodruff library at the Atlanta University Center, which serves four historically black institutions: Spelman and Morehouse colleges, Clark University, and the Interdenominational Theological Center. Ms. Kunnapas, Pam Bamberg (Lindsay’s mom! 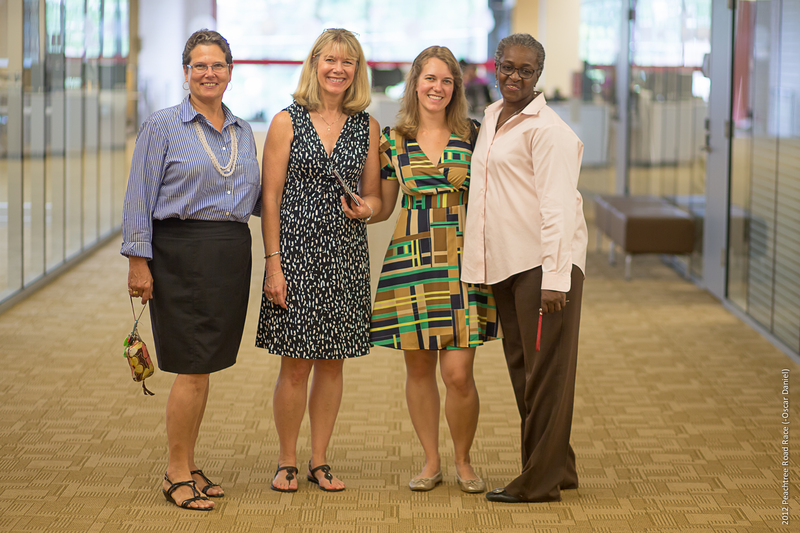 ), Lindsay, and Mrs. Daniel at the Robert Woodruff Library. Photograph taken by Mr. Oscar Daniel. Both Ms. Kunnapas and her colleague, Jacquelyn Daniel at the Woodruff Library, gave inspiring accounts of their experiences as academic librarians. For Ms. Kunnapas, her position as Director of Library Services at DeVry Atlanta Metro, which she has held for four months, was her first time with the job title that clearly marked a leadership position. Nonetheless, in her previous positions, she prepared herself to lead by jumping at the chance to do anything and everything, getting a taste of reference and circulation, acquisitions, instruction, budgeting, management, and access services. She believes these highly varied experiences put her in a much better position to manage a library where she is the only full-time trained librarian–and therefore the “jack of all trades”! Ms. Kunnapas is full of energy and ideas, and wants to transform the way the DeVry Atlanta instructors perceive information literacy skills and the library’s role in improving them. Ms. Kunnapas is proposing a for-credit course that will lay the foundations of research for the many students who enter DeVry. Ms. Kunnapas showed me a fifteen minute Power Point presentation that serves as her “elevator speech” to instructors, showing them the vast array of resources the library can provide for their students as well as the practical analytical skills needed to assess information. She carries this presentation on a flash drive with her everywhere and takes every possible opportunity to talk to instructors about coming to their classrooms to do an instructional session. As a “solo librarian,” Ms. Kunnapas was adamant about the need to show your value, to be connected with the rest of the organization and be a part of whatever their latest initiatives are. She is campaigning to revamp the library’s image as a place that is the heart of the academic community. I have no doubt that Ms. Kunnapas is on the right track, following the needs of both the students and the instructors, and trying to gain buy-in for a much broader vision of information literacy skills. 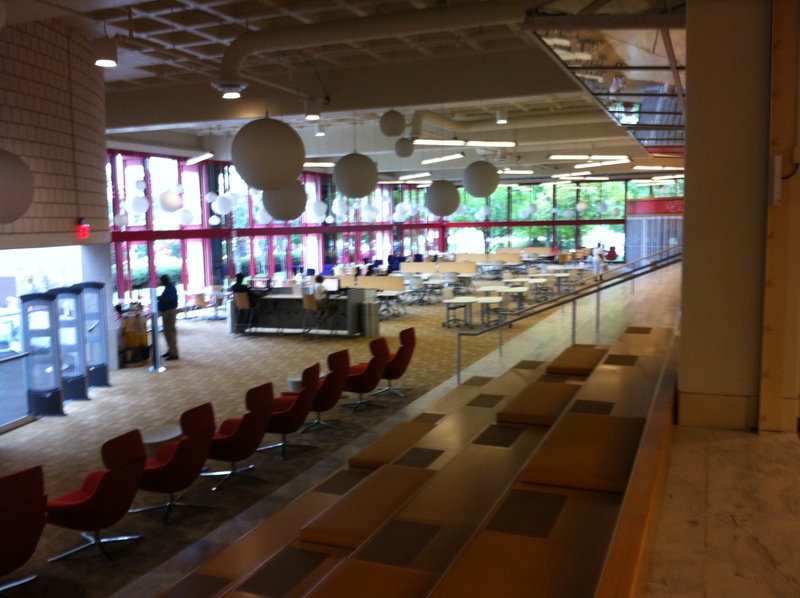 At the Woodruff library, Mrs. Jacquelyn Daniel showed us around their beautifully renovated space. Mrs. Daniel is a reference librarian for the social work and psychology subject areas, as well as the liaison librarian for students and faculty at Clark Atlanta University. She does reference, instruction, some acquisitions, and outreach in her role. The new space features amphitheater-style seating near the front entryway, suitable for lectures or events, the 360 degree “Echo” room for instruction that allows the instructor and class to be taped for later consultation by students, audio/visual editing studios, presentation practice rooms, and small group meeting rooms that feature TeamSpot collaborative software. 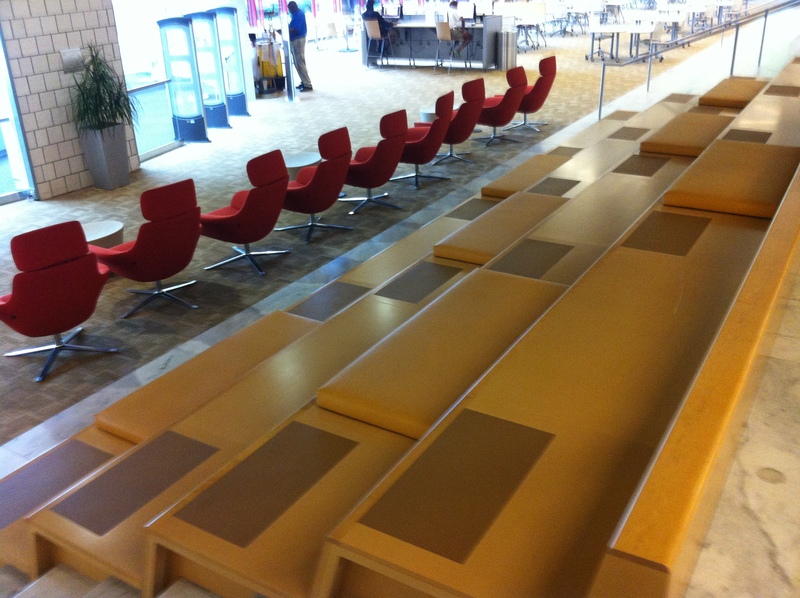 Furniture in the new space is easily moveable and can be reconfigured for a variety of group or individual needs. Whimsical light fixtures make the space feel modern and fresh; art and sculpture can be found throughout the library, cleverly combining gallery space with functional spaces. 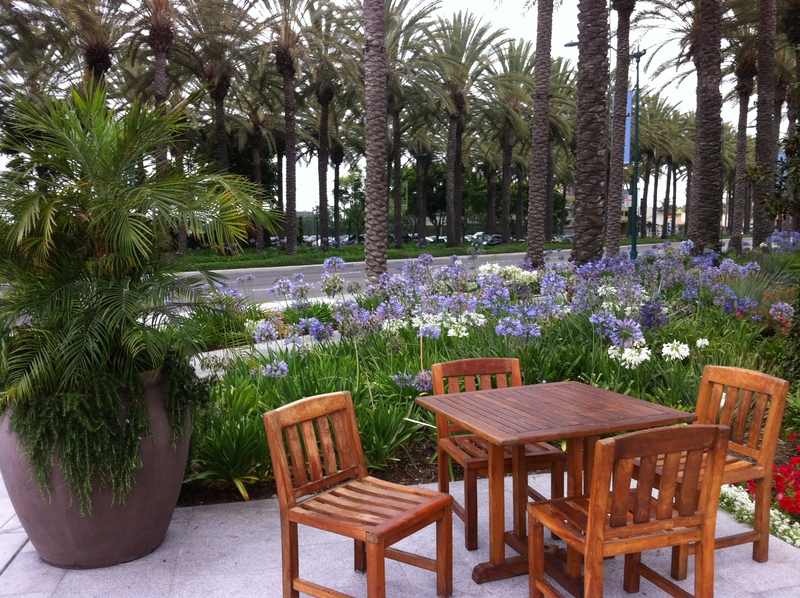 A large casual seating area near a Starbucks was filled with natural light –even though our visit was during the relatively-slow summer term, several students were studying and relaxing there. I am so thankful to Ms. Kunnapas and Mrs. Daniel for showing me their wonderful libraries and letting me get a glimpse of the working lives of academic librarians! 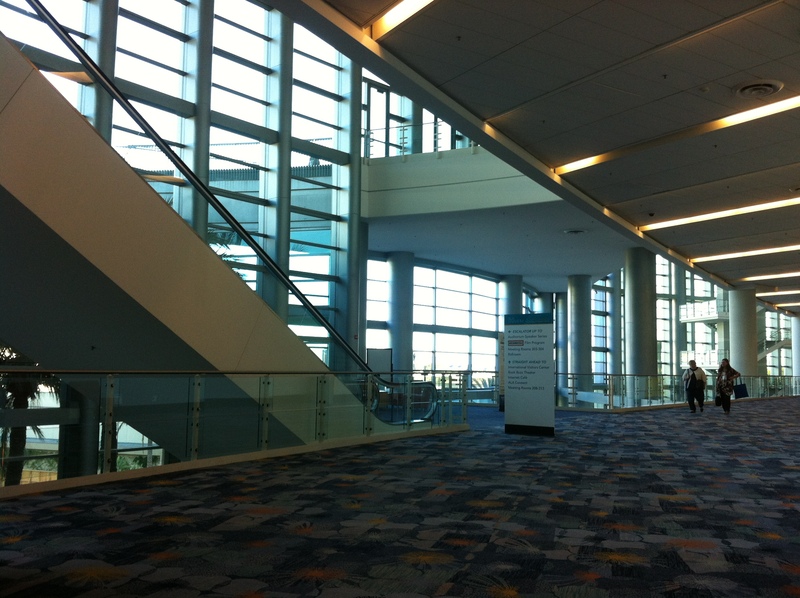 I’ve just returned from my first American Library Association Annual conference. I had a wonderful time and met many lovely people. While I heeded the advice to wear comfortable shoes, there were a few things I wish I would have known! Dress warmly for the air conditioning in the convention center. A light sweater is not enough. Long underwear might be acceptable. Bring a notepad or notebook that will fold over on itself rather than a fancy portfolio that opens flat. When you are squished in between people in a session, they may glare at you if your stuff spreads onto their laps. Don’t go to the opening of the Exhibit Hall. Those mild and friendly-looking librarians may stampede when the Exhibit doors open. Also, it is unwise to get between anyone and the free canvas bags from Baker and Taylor with cats on them. The Unconference- the Marketing and Programming discussion tables yielded some great ideas for increasing the visibility of your library and its programs. My favorite: a bike outreach cruiser that goes around to local festivals and farmer’s markets promoting the library and signing people up for library cards. Pima County Library is already doing this. Could I have this job, please? Keynote speech- Consent of the Networked author, Rebecca McKinnon, gave a sobering talk on ways governments and corporations are undermining internet privacy and censoring free speech in the U.S. and around the world. McKinnon has a great TED talk if you want a taste of her thought-provoking research. LibValue and Academic Library Assessment- some wonderful research projects are going on around the country, funded by IMLS and headed up by Dr. Carol Tenopir of University of Tennessee and Bruce Kingma of Syracuse University. The projects will help establish new ways of measuring the value of academic libraries, including Return On Investment measures and use of the contingent valuation method. ACRL 101- Great information about how to get involved with ACRL divisions, committees, and interest groups. Did you know there is a ‘List of Lists‘ for all of the ALA-affiliated listservs? Thanks to Lindsay Sarin for pointing this out! ACRL New Members Discussion Group- This panel discussed the “Other Duties as Required” in your job description, including pros and cons of working in areas that are not part of your “essential duties” and the perspective of library leadership, who often need flexibility among staff to help cover shortages and reduced budgets. 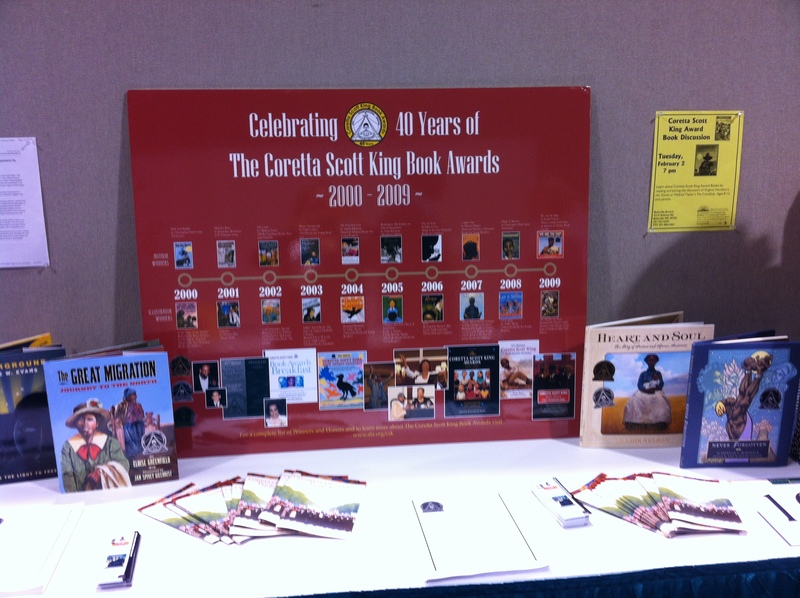 A display of the 2012 Coretta Scott King Book Award finalists at the Diversity and Outreach Fair. San Diego County Library’s beautiful custom-built bookmobile that travels thousands of miles each month. If I could live in one of these, I think I would. Finally, a huge thanks to Elliot Mandel and John Amundsen at the Office for Literacy and Outreach Services and to Don Wood at the ALA Student-to-Staff program for allowing me and 39 other LIS Students to attend this year’s Annual conference! Do you have tips for me on attending future conferences? Were there great ideas that you heard about at ALA? Please share your thoughts! Every Lego-lover’s dream! 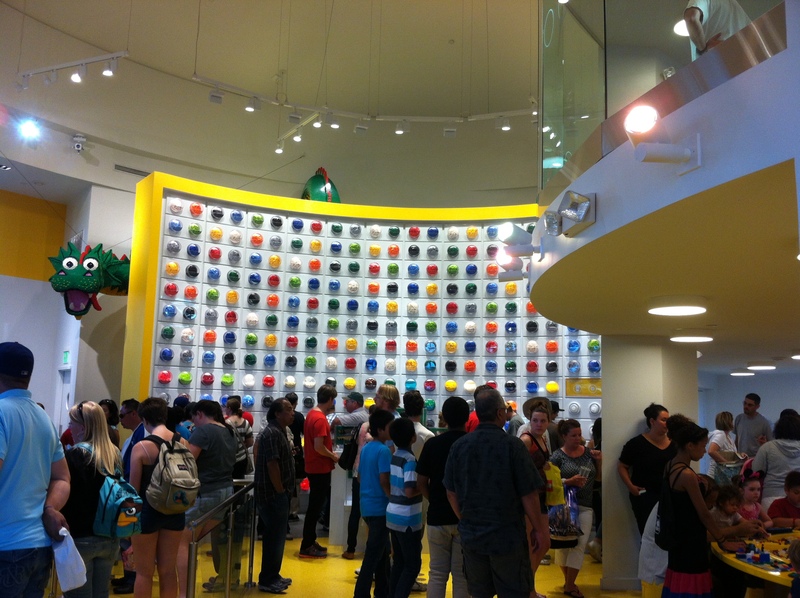 The awesome Lego store at Downtown Disney. I really enjoyed 2 of this week’s articles in particular, “Designing a music digital library: discovering what people really want” and “The people in digital libraries: multifaceted approaches to assessing needs and impact.” I like that both articles had a practical, real-world focus when examining prototypes of digital libraries and trying to analyze what users are really looking for. By examining a popular music forum website and comparing it to the Meldex digital music library, the authors of the first article discovered elements of the user component that the Meldex digital library didn’t offer: interaction and information exchanges with other music fans. I thought it was especially interesting that the Meldex system offered a search-by-humming feature that users were not taking advantage of, and that the authors found many users preferred to browse or ask other people when trying to track down a particular song. In the second article, the needs assessments for the three prototype digital libraries also revealed some interesting themes. The second case study featured, the Baltimore Learning Community, revealed that teachers really didn’t have the time to invest in creating and sustaining the digital library. The third case discussing user needs assessments for the National Digital Library project also showed gaps between what media-specialists and teachers thought would be most useful for them. I think this just goes to show that while DL designers and creators may think they are filling a need for a particular user group, confirming this with a wide variety of potential users in the community can save a lot of time and money! I loved the quote from the “People in digital libraries” article, “An inherent limitation in directly assessing the human needs for an innovation is the fact that potential users must imagine what the innovation can and will do for them. This is very difficult to do and innovators often justify adopting a “build it and they will come” policy based on their own imaginations of needs and applications” (Marchioni, et al). My takeaway from these two articles was that DL designers need to balance “build it and they will come” with a thorough understanding of what users really say they need and want.